(the flag of the Hawaiian CHIEF) all proper. MOTTO: Kulia-i-a-nuu (Hawaiian meaning "Onward, still higher, win the day, gain the victory". The 9th Field Artillery Regiment (parent organization of the 9th Field Artillery Battalion) was organized in 1916 in Hawaii form the 1st Artillery. This descent is shown by the stand of grape shot in the canton, taken from the coat of arms of the 1st Field Artillery, which commemorates General Taylor's famous remark to the Battery Commander in the old regiment at Buena Vista, "A little more grape, Captain Bragg". 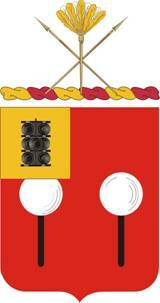 The place and origin and first station of the 9th Field Artillery Regiment are depicted in the remainder of the arms: The shield is red for Artillery. The two Hawaiian puloulou--a black staff with a white ball--were ancient emblems of the country and were placed on each side of the gateway to the king's quarters. The crest is an alia, the two crossed spears which were placed in front of the King's house. The puela, the duster-like flag of the king, is drawn with nine plumes, five gold and four silver, indicating the number of the organization. 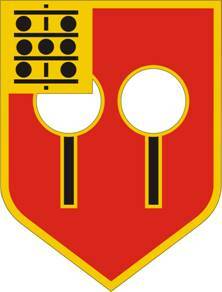 "The Mighty Ninth" traces its origin to the activation of its parent regiment, the 9th Field Artillery, on 6 August 1916, at Schofield Barracks, Territory of Hawaii. The 9th was organized and equipped to be the first completely motorized artillery unit in the Army. As such, she was challenged at birth to prove that the, then radical, concept of completely motorized artillery was valid and practical. That the challenge was accepted is evident. By her performance the advantages of highly mobile artillery on the modern battlefield were proven and were considered in the organization of future artillery units. After the declaration of war with Germany, the 9th Artillery was ordered to the mainland. She departed from Hawaii with the 1st Artillery in December, 1917. She was sent to Ft Sill, Oklahoma and assigned to the 19th Division. The Armistice was signed before the unit was sent to Europe. She remained at Ft Sill, the mecca of the artillery, for several years until she was ordered inactivated in 1921. From 1921 until late 1939, the 9th Artillery remained inactive, though two of her subordinate battalions were activated during this period of peace. The 1st Battalion was on duty from October 1926 to September 1927 at Fort Des Moines, Iowa, and the 2d Battalion ws active at Fort Sill From October through December 1922. The 9th Artillery, while inactive, was assigned to the 7th Division on 24 March 1923, to the 9th Division on 15 August 1927, the 4th Division on 1 January 1930, and, finally, to the 3d Division on 1 October 1933. She was to remain on organic unit of the 3d Division up to and throughout World War II. On 1 October 1939, the 9th Artillery Battalion, a subordinate unit to the inactive 9th Field Artillery Regiment, was activated at Fort Lewis Washington, in anticipation of the ensuing war. She moved with the 3d Division from Ft Lewis, Washington, to Camp Pickett, Virginia, in September, 1942. This new location was a staging area, for on 24 October 1942, the Division sailed from Norfolk, Virginia. Destination: French Morocco. Fedala soon fell, and on 11 November, Casablanca was occupied. The primary mission of the 3d Division ws now to prepare for the invasion of Sicily. The preparations were interrupted in February 1943 when over 3,000 members of the division were sent to Tunisia to aid in repulsing the stiff German counter-offensive. In June, the entire division moved to Tunisia to exploit the success of the II US Corps. After the conquest of the Axis troops in this area, the division embarked on the invasion of Sicily. At 0200 hours, 10 July 1943, the invasion began. By 0630, Battery A, 9th Artillery Battalion had landed and gone into position. It was during this campaign that, for the first time in any operation, naval gunfire was successfully directed from an artillery FDC. After over a month of intense fighting to clear the island, the division was able to rest in preparation for its coming campaign in Italy. On 18 September 1943, the Division Artillery landed south of Naples, Italy. During the follow two months, the division penetrated the German winter line and forced the approaches to Cassino when relieved by the 36th Division on 17 November. The 9th did not go out of action however. She followed the Infantry into Anzio and helped to blast their breakthrough to Rome. Rome taken, the 9th prepared to join the invasion of Southern France. On 15 August 1944, the division landed. One month later the enemy had been pushed 358 miles inland and the 9th prepared to support the crossing of the Vosgos Mountains, a feat that had never been accomplished by a military force opposed by an enemy. By early January the mountains lay behind but so did over 6,000 casualties the division suffered in the crossing. Ahead lay the Celmar Pocket where the intense action against a determined enemy would earn the division the Distinguished Unit Citation and the French Croix De Guerre with palm. The citations at Annex A and B tell the story of this action. At 0100 March 15, 1945, the 9th contributed to the massive artillery preparation that initiated the division's drive into Germany. Thirty-one minutes later the first unit stood on German soil At Worms, the battalion crossed the Rhine. From here the road led through Schweinfurt, Nuremberg, Munich, Salzburg, and finally ended at Berchtesgaden on 5 May 1945. When German Field Marshal Kesselring, succeeded Field Marshal Von Rundstadt as command of the German west front, was asked, "What was the best American division faced by troops under your command on either the Italian or Western fronts? ", he named four divisions. Without hesitation, the Third Division was placed first on the list. As an divisional unit, the 9th Artillery Battalion was partly responsible for the division's enviable reputation. Soon after the 9th Artillery Battalion returned to Fort Benning, the Korean conflict began. In early August 1950, the 9th Artillery was ordered to Korea as a separate battalion, thus leaving the Third Division for the first time in seventeen years. Three days after arriving at Pusan, the 9th went into action in the famed "Bowling Alley" near Taogu. After a three-week pitched battle in support of the 1st Cavalry Division, the Communist attack was completely broken. The 9th Artillery was then assigned to the 1st Republic of Korea Division, acting as the principal fire support unit. After breaking out of the Pusan perimeter, the 1st ROK Division and the 9th Artillery advanced through Seoul, Pyongyang, Pakihon, and finally to Unsan, 600 miles up the Korean Peninsula. At Unsan, about 50 miles from the Manchurian border, the 1st ROK Division engaged and was surrounded by a Chinese Communist Corps. Firing in a complete circle, the 90th assisted in storming the savage Chinese attacks for four days before being forced to withdraw. The 9th provided continuous support for the 300 mile withdrawal, firing mission after mission and moving only to go into position to fire again. This support enabled other units to withdraw in good order and with a minimum of loss in men and material. The 9th Artillery Battalion rejoined the 3d Division in South Korea on 17 January 1951 and remained with it throughout the war. While in Korea, the 9th supported every division committed, including Korean divisions, with the exception of the United States 7th Divisions and compiled a record of over 730 consecutive days in combat. In March 1954 the 9th returned with the 3d Division to Fort Benning, Georgia, where she was inactivated. concurrently, she was activated in Germany as an organic Artillery battalion of the 10th Infantry Division. Upon reactivation, she was designated "The 2d Field Artillery Battalion, 9th Artillery". On 14 June 1958, "The Mighty Ninth" was relieved from assignment to the 10th Infantry Division and inactivated at Fort Benning, Georgia. The Mighty Ninth was again reactivated as the "2d Howitzer Battalion, 9th Artillery" on 1 April 1960 and assigned to the 25th Infantry Division at Schofield Barracks, Hawaii. She had returned to her birthplace. The 2/9th remained n Hawaii until late 1965. Much of the time was spent in the field. With tensions building in Southeast Asia, the Mighty Ninth was challenged to prove that artillery could effectively support ground forces in a jungle environment. She helped to prove that the use of artillery was not only feasible, but necessary as the only totally reliable fire support means available. In addition, she was called on to test various concepts for the employment of Artillery operating in a jungle environment. From these tests, ideas evolved which, though radical, would improve the support provided by all artillery units destined to fight in Vietnam. In December 1965, "The Mighty Ninth", as part of the 25th Division's 3d Brigade task force, received orders for deployment to Pleiku, Republic of Vietnam. The battalion departed Hawaii in late December with its first firing unit, C Battery, arriving in Pleiku on 1 January 1966. The Vietnam war would be a new experience and a challenge for Artillerymen everywhere. There were no front lines to offer security. Enemy action, from small and harassing to large scale and violent, would flare up anywhere, anytime. Small, mobile ground forces would move great distances with little warning or time for prior planning. On such a battlefield supporting artillery would be widely dispersed and fragmented to support the Infantry. A battalion's batteries would seldom be within mutually supporting range. Batteries themselves would often be divided to support small unit operations. From early February through the next 3 months, the 9th supported the 3d Brigade in Operations Taylor, Garfield and Longfellow. Those operations, though considered minor, resulted in 160 enemy soldiers killed in action. On May 1966, the 9th became part of what was to become one of the largest operations in the Vietnam war--Operation "Paul Revere", under operational control of the 1st Cavalry (Airmobile) Division. Elements of the third Brigade and supporting Artillery were moved quickly and continuously to various locations in the highlands in an effort to unsettle and destroy the enemy. The battalion co-located its headquarters with that of the 3d Brigade ("None Better") at LZ Oasis, a landing zone southwest of Pleiku, which was to become the battalion's "home away from home" for more than three years. Operations Paul Revere I, II, III, and IV saw the battalion and its supported brigade fighting in and around Plei Djereng and Duc Co, on Highway 19 from Pleiku to the Mang Yang Pass, and over the rugged Chu Pa Mountains. The fighting resulted in heavy enemy casualties. Over 1700 NVA were killed in action with a large share of those "kills" direct attributable to the fires of "The Mighty Ninth". On 20 April, the 3rd Brigade and "The Mighty Ninth" were ordered to Quang Ngai Province as part of Task Force "Oregon" under the operational control of I Field Force (IFFV) Headquarters. Vicious clashes with elements of two North Vietnamese divisions and smaller Viet Cong battalions resulted in 3,000 enemy dead by the summer of 1967. On 1 August 1967, the 3rd Brigade and the 2/9th Artillery were transferred to the 4th Infantry Division where both would remain for the rest of their service in Vietnam. On the night of 30 January 1968, Vietnam erupted into a massive battlefield. The 3d Brigade with its direct support Artillery battalion held off determined enemy attacks on coastal cities south of Da Nang, killing more than 600 enemy soldiers in nine days of aggressive fighting. During TET 1968 operations (Code name: Wheeler/Wallowa) the 3rd Brigade supported by the 9th succeeded in driving the 2nd NVA Division from the Coastal Plains and jungles near Chu Lai, Da Nang and Duc Pho. In early April, the Third Brigade with "The Mighty Ninth" returned to 4th Division's control and took part in Operation "MacArthur" which resulted in repulsing enemy thrusts form Cambodia, toward Kontum. More than 5,000 enemy were killed by men of the 4th Division. In November 1968, the 9th was chosen to receive the new M102, 105mm howitzer. All three of the battalion's batteries were armed with this new lightweight weapon. It would be more than a year before other Artillery battalions in the division would be so armed. In early February 1969, operation "Sledge Hammer", an effort to clear the Chu Pa Mountains commenced. When it terminated three months later, an estimated 500 enemy soldiers had been killed. In early March 1969, the Might Ninth supported the 3d Brigade in Operation "Hines". Recognizing a reduction in enemy activity the operation placed emphasis on support of the Government of Vietnam Pacification Program. Operation "Hines" continued through the summer, fall and winter months of 1969-1970 marked by light and scattered action. Enemy forces launched two abortive "sapper attacks" on 3d Brigade firebases during this period. On 11 May, an enemy raid against the 3d Brigade and 9th Artillery Headquarters at LZ Oasis was repulsed leaving 65 enemy dead. On 6 November, sappers attached LZ St George, a firebase occupied by A battery, 2/9th Arty, resulting in 41 enemy soldiers killed in action. On 12 January 1970, US Military Command Headquarters in Saigon announced that the 3rd Brigade with its direct support artillery battalion would be included in President Nixon's Phase III redeployment of troops from Vietnam before mid-April. The history of the "Mighty Ninth" in Vietnam is, for the most part, the history of the 3d Brigade. The two were inseparable. The guerrilla war in Vietnam demanded it. The "Redleg" offered support by firepower to the "Grunt". The "Grunt" secured the "Redleg" from enemy attack. The actions of each cannot be separated. The both contributed and both can be credited with their total success. The Mighty Ninth will soon retire. It will be a sad occasion; but she is no peacetime soldier. As always before, when her country needs her, she will be ready to fight, ready to fulfill her mission of providing fire support to the ground gaining army and ready to again live by her motto: "Onward, still higher, win the day, gain the victory". Document Source: With many thanks and great appreciation to Sp4 Walt Schneidereit, he has provided us with this excellent documentation of the 2/9th's history from its origin through its sojourn in Vietnam. As noted in the history above, "The Mighty Ninth" left Vietnam in April, 1970, and, consequently, this is where the documentation ended.